Basic — most of nights in tents or rooms with shared WC, some nights in comfortable rooms. Standard — most of nights in comfortable rooms, some nights in tents or rooms with shared WC. Upgraded — all nights in comfortable rooms. If you want not only see the beauties of the Russian winter, but also test yourself in the real polar expedition, we propose to the tour “Putorana plateau by snowmobiles”. It’s a real adventure in one of the most amazing places in Russia – Putorana plateau! There are no roads and we will ride there by snowmobiles accompanied by the experienced park rangers of the Putorana Biosphere Reserve. After getting over more than 150 km by the frozen rivers and lakes, you will reach an absolutely wild place far away from the civilization. The intense excursion program will be appreciated even by very exacting tourists. You will see the region of icefalls and canyons, cross the overflow ices many kilometers long, ascend the edge of the plateau from where you will get an amazing panoramic view. In the evening, you can have a good rest at the only resort of the plateau with Russian banya (sauna) and taste the local cuisine. The host will show you his unique collection of the cultural and everyday life object of the local people. For the fishing lovers there will possibility to take all necessary equipment for the ice fishing. For those who are looking for the solitude, we suggest the walks in the taiga. The weather there is very unpredictable and deceptive, that’s why the tour can be called ‘the expedition” and a real challenge. However, all brave hearts will be thanked by the possibility to visit this insufficiently explored plateau, to see the breathtaking landscapes and, of course, to observe the northern lights ! 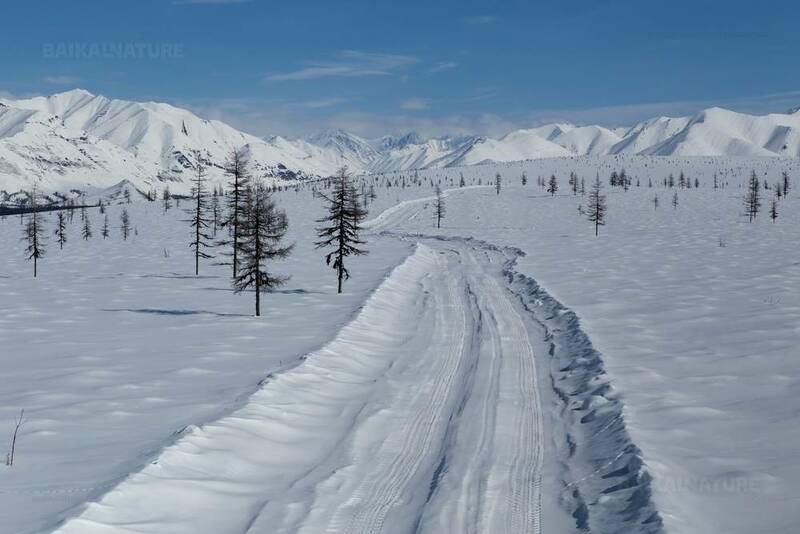 You will go to the Valyok port where our snowmobile tour starts. As during next 9 days there will no any shops, please, take care of the shopping in advance. Check-up of the equipment and safety-awareness briefing. Departure by 2 persons in the special sledge behind the snowmobiles. The itinerary goes by the frozen lakes and rivers. Then you will cross the hummocky neck of land covered by forest-tundra. 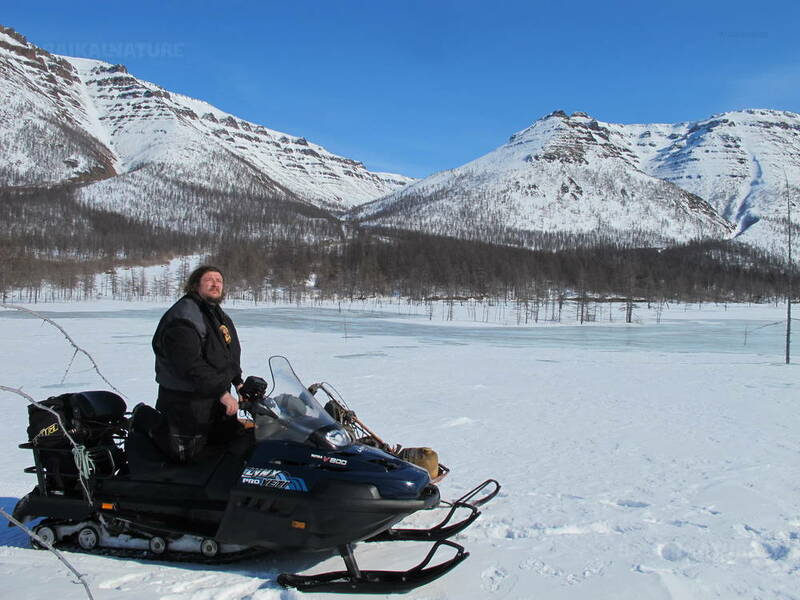 The snowmobile is driven by the experienced park rangers and the sledge are specially equipped for the extreme cold. 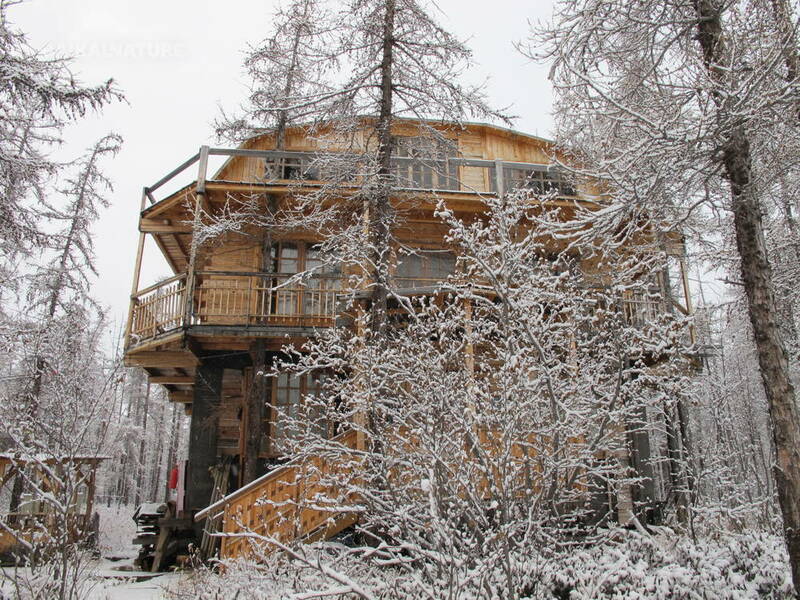 The resort "Bunisyak" is situated in the remote end of the Lama lake. It's surrounded by the mountains higher then 1000 metres. When it's sunny you can take the binoculars and observe the Putorana snow sheep, inscribed into the IUCN Red List of Threatened Species. 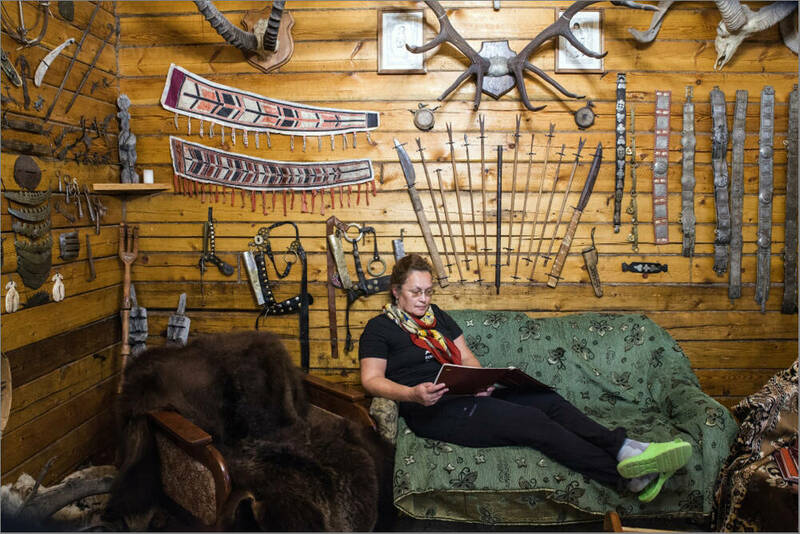 The owner of the resort will show you his unique collection and tell you about the history of the Dolgans, shamans and the Nganasans. Accommodation at the resort "Bunisyak"
In a company of the park rangers you will go by snowmobiles along the valley of the Hoicy river. The extension of the itinerary is about 50 km. This river is known for a big number of waterfalls that in winter turn to the icefalls. Firstly, you will drive the canyon and then you will cross a huge overflow about 10-12 km long. We will ascent 630 meters above the sea level where you can see the picturesque icefall with the 30 metres height and 50 meters width. It's possible to come close to it fro making the rare photos of one of the most beautiful places of the Putorana plateau. Return to the resort in the evening. You can do the ice fishing, go skiing or take special snow shoes - rackets. The dinner with the Dolgans and the Nganasans traditional plates. 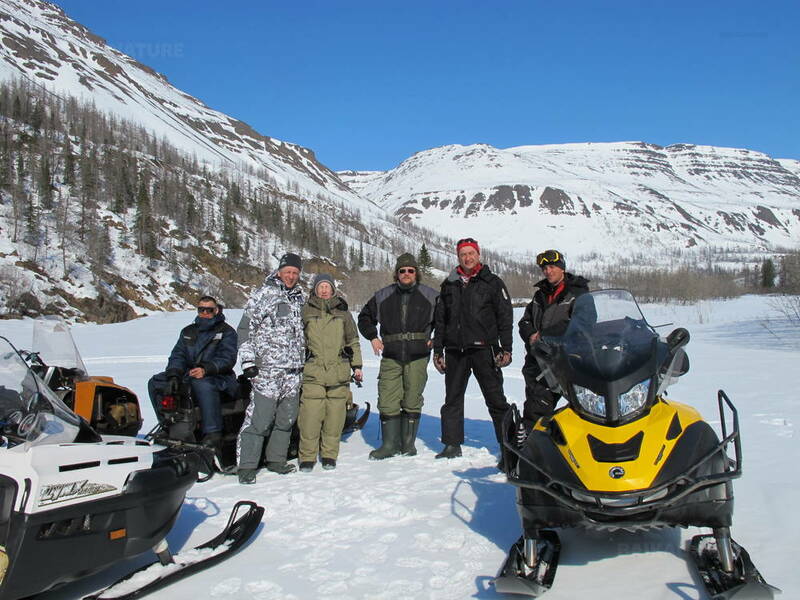 This day there will be the snowmobile excursion on the Bunisyak river that gave the name to the resort. Firstly, you will go on the Talaya river falling into the Bunisyak river. The approximate extension of the itinerary is about 45 km. Along the river's banks there are ice-covered canyons. The water is so pure that you will see the fish in the ice-holes. After the fishing, return to the resort. After the dinner, there will be an excursion to the unique ethnographic museum. Its collections consists of the objects of the everyday life and culture of the local people. 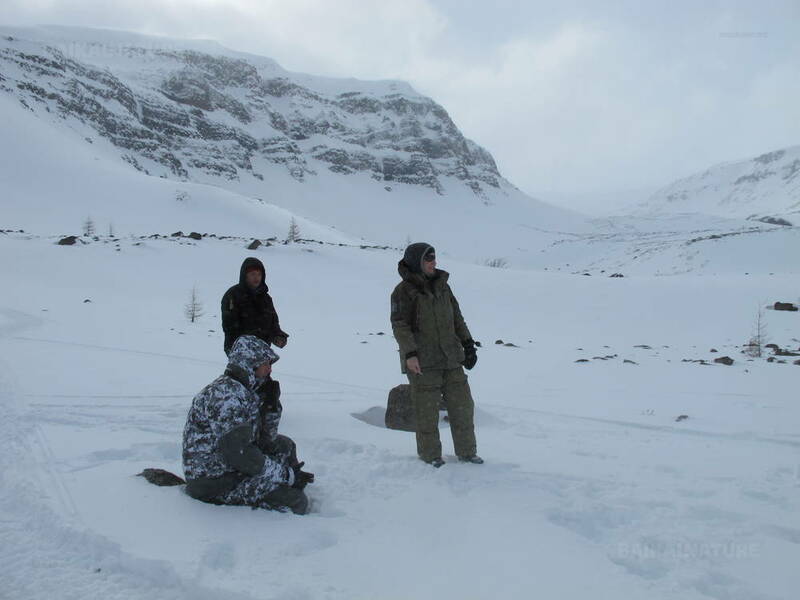 You will lift to the Putorana plateau on snowmobiles along the nameless stream. 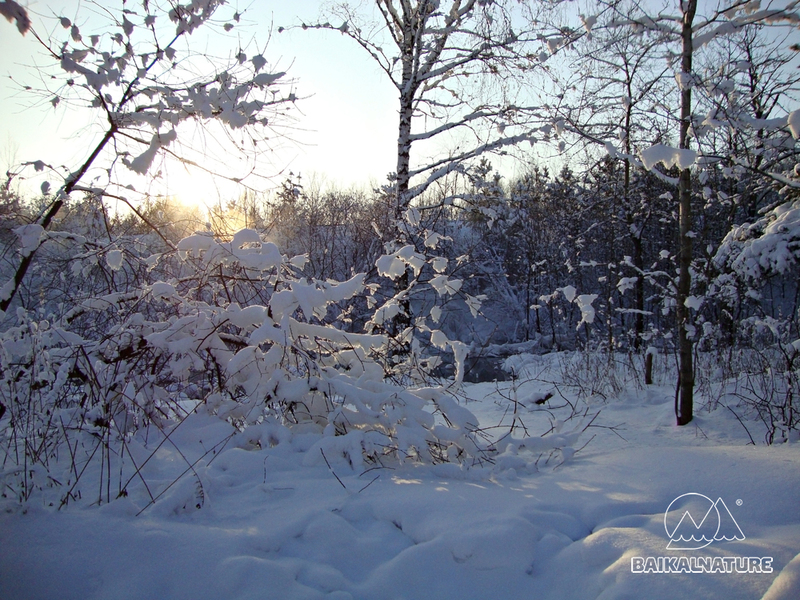 There is no any trails, so the possibility of this excursion depends on the weather and snow conditions. On the top of the plateau there will be the panoramic view. During years these places are not visited by someone. 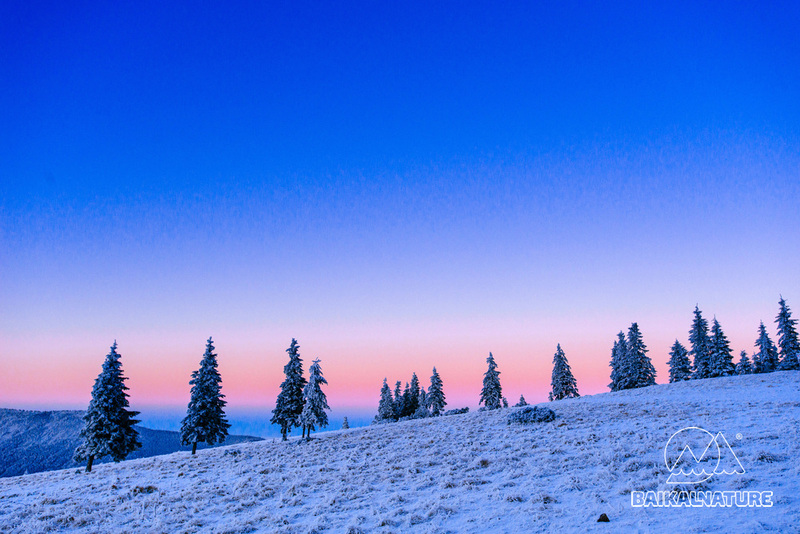 You have a chance to see the real wild nature 1150 metres above sea level ! If the weather is not good, the itinerary will be changed by another one. Today there will be an interesting and intense itinerary (about 80 km). Firstly, 10 km on the frozen Lama lake. Then we go by the Bucharama river and ascend it (about 12 km). In the turning point we will on the Geological river, the confluent of the Bucharama river. 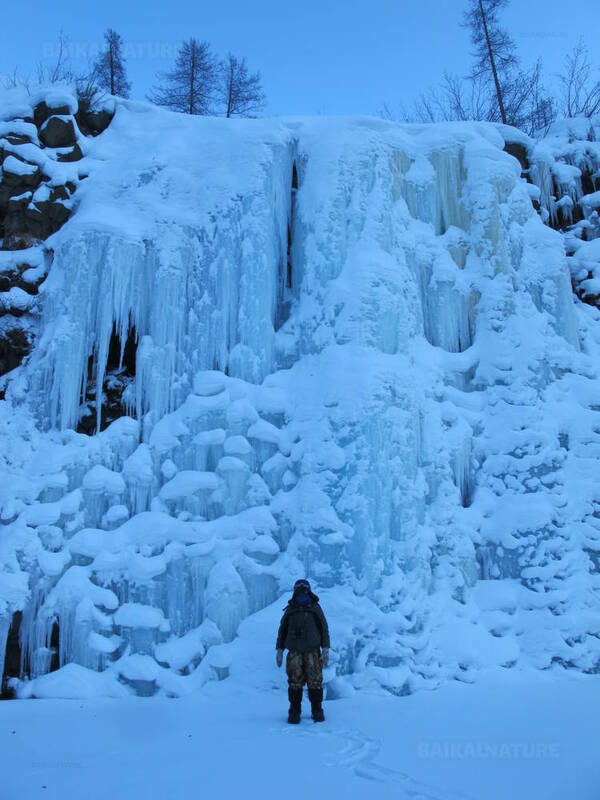 There will be very breath-taking beautiful canyon and cascade of the icefalls. Accommodation in the hotel "Norilsk"
We will go on snowmobiles along the banks of the river Amon-Yuryakh. the name of the river means on the Ewenki language "Deep stream". On its valley we will visit a lot of ice falls and great aufeis. This day will be a reserve in case if the weather doesn't allow us to leave the city the first day or to make one of the excursions. If the weather is fine, you will have possibility to make another excursion on the plateau. The return itinerary will be the same as the first day. This day is a reserve one and it will be used if the weather won't allow us to start the snowmobiling the 1 day. If the weather is fine, this day you will have an excursion in the Norilsk city. You will get acquaintance with the history of the city and with the history of the Polar land development. Norilsk is the northernmost city in the world located above the Arctic Circle (69° north). There the winter lasts more then 9 months a year. Moreover, there is no roads and railways. However, the city is still alive and is considered as a Russian nickel capital. Discounts are applied to all services indicated on the official website of BaikalNature. Discounts aren't summarized with special offers and are not applied to individual tour programs. Travel smart with our discount system! For more info, please download the detailed description of the trip. The itinerary of the tour can be changed according to the weather conditions as well as unforeseen events. For the foreign residents it's needed to get a special entry permit. The documents should be filed 3 months before the departure. For this, we need the following documents: - copy of your Russian visa - notarial translation of the passport (all pages) The accommodation at the resort "Bunisyak" can be organized by 1 or 2 persons. How does our reviews system work? No reviews anymore or no reviews at all for this destination. Below all reviews. Would you like to travel with BaikalNature again? Yes! Cette expérience érémitique s'adresse à des personnes autonomes. Très beau voyages, des volcans, et des ours !! Nous avons fait appel à Baikal Nature pour la 2 ème fois.nous sommes toujours contents de la prestation proposée qui a répondu en totalité à notre demande.Si nous revenons en Russie nous solliciterons à nouveau vos services. Très bien ! J'ai fait un super tour avec une très bonne organisation. A recommander ! They travelled with BaikalNature and speak about their tour. Discover their testimonies! Since 2012, we collect reviews from travelers who trusted us. At the end of their stay with us, each participant of our tours receives an e-mail asking to answer a survey in order to evaluate the quality of the given services. Rating goes from 1 – very poor to 5 – excellent. The published rating is the average of the ratings assigned from the traveler to each of those 6 fields. With due regard for transparency and integrity, we do our best to publish all reviews, good ones as bad ones. Reviews are published as they have been written by their authors. This webpage is meant to be a space where one’s can share and discuss. Therefore, BaikalNature retains the right to answer travelers' comments. Data « Overall rating » and « Travel with BaikalNature again? » give the average rating for all received evaluations. They are automatically calculated by our system.